At first it was a bit of a shock. I didn't actually know I had a new hobby until the realisation hit me. I've always thought of myself as a War Gamer that doesn't game as I very rarely get to push figures round on a war gaming table. Then when I came to terms with the lack of dice rolling I started to think of myself as a Modeler and Painter - all be it one that rarely picks up glue or a paint brush. So I had kind of compromised on the idea that I was an Army Collector. I dont think of myself as a figure collector as I do only collect things I can put in armies (although i also have this nasty habit of also buying things to build new armies around) and I like drawing up the force lists (don't say codices codexes?) for all the mythical, never-to-be-played-out battles that they will fight. I had also thought I might just be a Figure Buyer. Which has some truth, but is entirely Ebay's fault. But then over the last couple of days I have been sorting through some of the collection and organising storage etc. And it hit me. 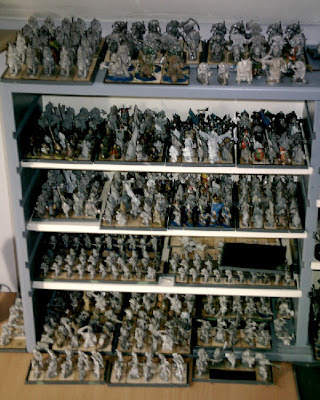 There is something deeply satisfying about being able to fit your collection into just the right number of movement trays or an even number of boxes, or having just the right storage system to keep the dwarfs away from the orcs. Not that I have achieved any of these states of Nirvana yet, but I can feel the need to do so growing. But I do have a nice newly cleared painting area with ranks upon ranks of newly based and organised troops to work through... so i have no excuse for not painting now (or at least no excuse my hopelessly lethargic and inventively procrastinatory brain can yet come up with). The first 2 are of my shelving unit in full view 2 feet from my chair right next to the computer keyboard and my painting desk. So its impossible for me NOT to see what I need to paint and draw inspiration and enthusiasm from all their excited little faces. The left side of this holds about 900 figures. These are the Old Grenadier Fantasy Warriors Dwarfs and Orc/Goblin armies I've posted about before. Is it wrong to have 2 armies with 60+ movement trays/units? 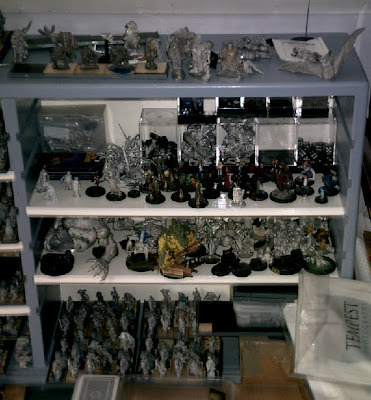 The right hand side of the shelving contains on the lower shelf, more orcs and goblins, above that my VOR growler collection, and above that various RPG figures along with dice, Rogue Trooper forces and ABC warrior team. Oh, and my embryonic Hasslefree Sci-fi human contingent. The top has ogres and bat + bear riders. Ah, but I hear all of you people that know me from the FOD (and believe me I use the term 'people' in its most lax taxonomicological* sense), where are all the grym he keeps going on about? They're here... right on the windowsill in front of my desk - again where i cannot now ignore them. They're all based and in squad movement trays thanks to Fenris Games. So there you go - thats plenty to keep me going right? and lots to paint. No excuses now. Except... well there's this shoe box of confrontation figures and blisters sat on the desk and no room for them. And I can't get the Old Crow vehicles out that go with the grymn as there's no room, and my lizardman collection is still boxed and so are my dragons. PS I am reliably informed that the word should be 'taxonomical' but I like 'taxonomicological' better. I'm going the same way... I'm a roleplayer / wargamer but primarily a Miniatures Painter...but all I’ve done for a month is move unpainted lead from one box to another. I can happily spend hours sorting through my model box instead of picking up a brush. I feel a new New Years Resolution coming on. I wonder how long this one will last?